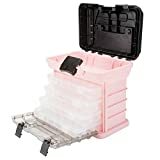 Great price on a solid small parts organizer / toolbox / craft box. Finally! My kids can sharpen their jumbo Crayons. 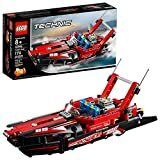 If you’ve got kids that are into LEGO Technic models, this boat set for $12 is a great deal. We own a cutting machine similar to this Cameo and even though we don’t use it to make money, rarely a week goes by that we don’t personally use it for something. With the right effort, this Cameo bundle will pay for itself in vinyl decal and t-shirt sales in a matter of weeks. This beast of a sewing machine has never been cheaper. Deal of the Day on Jigsaw Puzzles! Get your puzzle on with a massive selection of jigsaws to please your hobby and every other assembler you know. I wanted a cutting machine for the longest time and finally got one last year, a Cricut Maker. I used to wonder what I would use it for, and the answer has turned out to be so much more than I would have guessed. If you’re a maker or crafter, take advantage of this deal. The rose color of the Cricut Maker is down to just $340. This is the lowest price we’ve seen on a cutting / crafting / making machine that offers endless possibilities. We own one and use it to do everything from school projects, cut custom vinyl, negatives for etching glass, cardboard designs, iron-on t-shirts, advanced multi-part crafts, and much more. The Cricut Maker is as close to perfect as products get. This system will never be “cheap” but it is certainly a deal right now. I own it, and I’ll tell you that after a decade of homebrewing beer, this is the easiest, most consistent, most enjoyable way I’ve ever done it. Give yourself the gift of genetic and ancestral information. The AncestryDNA kit is the lowest price we’ve ever seen it, today only. While I prefer the Cricut Maker, this Cameo 3 bundle is half the price and comes with a ton of stuff today! Score Black Friday pricing on this season’s best-selling drone. If your kids are as creative as mine are, this easel is one of the best things you can buy them. It’s as gift that develops their gifts! If you’re into or want to be into LEGO trains, this train pack is almost never on sale, so saving 20% right now is a no-brainer. Sharpie Permanent Markers are On Sale Today! Several different packs and color combinations of Sharpie are on sale today! One of the most popular LEGO architecture sets is currently $10 off! Easily my favorite LEGO sets of the year, currently on sale. If you work (or hobby) with anything that produces dust or particles, you know how important these masks are to your health… and how expensive they usually are. Stock up with this deal. This is not only an excellent creative Lego set, it’s 30% off right now!